this is the second time i've purchased this eyeshadow primer. my first time wasn't really good at all. i found it too drying and it gets flaky after sometime. I made sure that i close the lid tighly so that the product won't dry out..but it still did. Also, my eyeshadow creases like crazy when i use this. So i gave it to my mom...and like me, she wasn't satisfied either. I've been hearing and reading a lot of raves about this primer and it really made me wonder how come it didn't work for me? is it because of my uber-oily lids? am i not using it right? am i using too much? or maybe too little? 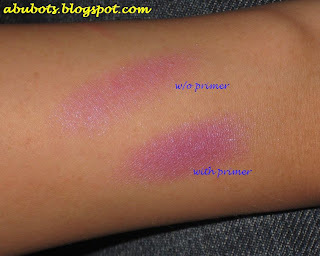 geeessh, i envy those who really find this primer a great product. in as much as i've wanted to try it again, it has been out of stock for a looooong time. and when i asked mom if i can get this back? well, she told me she threw it away already. So i guess i just have to stick with my ever trusted UDPP after all. But that would mean ordering online if i ran out of it...i really need a good alternative. so when Phoebe informed me that it's back in stock...i again got myself one. and yeah, i prayed so hard that it would work for me this time. the cream looks dark in the pot, but when applied, it becomes nudish-translucent (sorry, not good with descriptions) with a bit of shimmers. it does make the colors pop out more and this time, i apply it with a brush unlike before that i've been using my fingers. I've also noticed that it doesn't dry that fast anymore unlike before. The pot has been with me for more than a month now and it still has a creamy consistency. it's also cheap...i think less than P400? there's a wee bit of creasing...but hey, as compared before...this is such a big improvement. and i told you, i do have uber oily eyelids! maybe i'll try to wait a bit longer for my eyecream to be absorbed then wipe some of the excess before putting the primer. 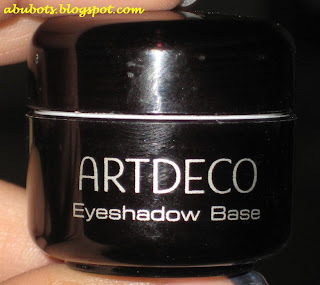 but yeah, i can honestly say that i am liking Artdeco eyeshadow base! This is one good alternative for my expensive UDPP. I just wish this won't get out of stock again. So for those who are looking for a great eyeshadow primer and doesn't have access to UDPP or TFSI, this is one great product you can use. Just make sure to close the lid tighly, so it won't dry out. Hmm...but i do think they kinda formulated this new batch. I've also read some rants a long time ago about this drying out in the pot. 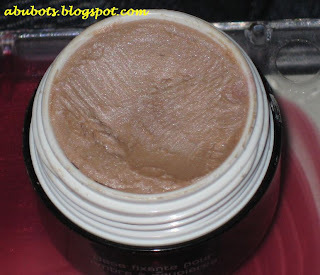 Will i repurchase? Definitely! This is my "SAVE" version for my UDPP. 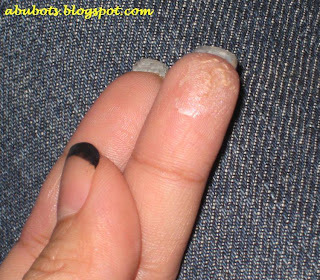 Iamsutil gives this product 2 thumbs up! i love it! i mean it's not as good as UDPP but it works for me. i'm alternating using this and UDPP. :) very good deal too! hmmm.. i maybe also got the "bad" batch of artdeco..
this is one great alternative to UDPP nikki, i usually use my UDPP on my clients but yun nga, hirap to get more stocks once you run out. at least this one's available locally and cheaper! you are so right, sab. actually i realized that i've been using this more often than my UDPP. maybe you are right diana, maybe i also got a bad batch of artdeco primer the first time i bought it. hey!! where did you get this at? This looks like a pretty good product. When I use e/s primers that come in pots, I apply it using a concealer brush instead of my just my fingers, and I've found that it works better this way so that it applies evenly. I'm sure if you continue to use the Artdeco by applying it with a brush, you'll get the most out of it. I also bought mine a couple of weeks ago when it was back in stock. I did notice some flaking, especially in the brow bone area. How were you able to prevent this? Do you really need to blend it very well? But it's so sticky that if I keep on blending it it starts to clump together. Any tips? Thanks in advance!